Labour has lost control of Nuneaton and Bedworth Borough Council by one seat. The Conservatives won 10 out of the 17 wards available, a gain of eight seats since the last election in 2014 but not enough for a majority. 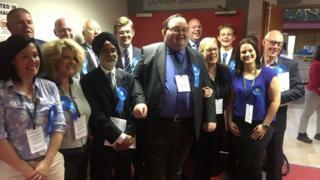 Conservative party deputy chairman James Cleverly said the success was "down to local party workers". Labour previously had 25 seats, but now has 17 with the Conservatives close behind with 16. Neither party was able to secure a majority in Nuneaton, where 18 seats were required in the 34-seat council. Tory MP for Nuneaton, Marcus Jones, said Labour lost "crucial marginal seats" and that seats won at Labour's expense were a "great result." Conservative party deputy chairman James Cleverly said: "Because of the work our local team put in we got a good result, I'm very pleased with that." Seventeen seats were up for grabs in the election. Labour held 14 of them and lost half - all of which went to the Conservatives. The Conservatives also won one seat from the Green Party, which now has one representative on the council. The party secured 51% of the vote with a 32% voter turnout. Nuneaton has been seen as a bellwether in recent General Elections, with the Parliamentary seat won by the Tories from Labour in 2010. The Conservatives then increased their share of the vote in both the 2015 and 2017 general elections. The party also gained a seat on Rugby, Council reinforcing its existing council majority with 24 out of 42 seats. In Coventry, Labour retained control of the city council with 40 seats to the Conservatives' 13, with 28 needed for a majority. Only one seat in Coventry, Earlsdon ward, changed hands and was won by Labour from the Conservatives. The city had a 27% voter turnout.